I've been in and out of a little funk this month so not many... *ahem* any, posts from me. I did still manage to attend my local market and drew tons of attention even though there were no sales. I also got back in touch with an old work friend. Well, I would call her a work friend but I guess these things are always so iffy when you lose your job. 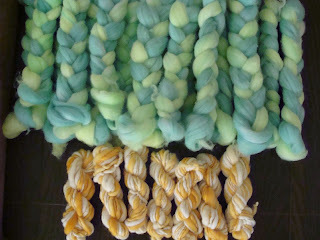 Anyway, outside of the market the only other thing I've managed this month was contributing to the Phat Fiber Sampler. I sent a mix of 27 yarn and fiber samples in and slipped in just by the skin of my teeth so to speak. I didn't get my market set up photos this time but I did get the Phat Fiber samples before boxing them up to go. This is a Flickr badge showing public photos and videos from Froggy Fibers. Make your own badge here.